Hey all I'm planning for the rigging stage. First I want to thank Clayton for all the detailed images he has posted during his build as it's a big help! 1. Looking at the BB kit the mizzen mast looks different to Claytons. The BB mizzen bottom pole is a straight pole with no square at the top. Claytons looks like its a smaller version of the fore and main masts. I believe Claytons to be correct but can't find close reference of how it should look at the top end of the bottom mast so if anyone can tell me how it should look or have good reference it would be a great help. 2. The lines of ropes that connects the parts of the main mast, how do they start and end? I can't tell by the pictures I've found. 3. 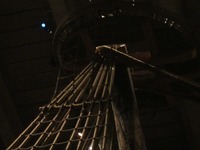 Am I correct that the ropes on Vasa when she first was rigged had no tar on them? That they would look close to the ones she has today? 4. Some drawings show her with skanskläder on the märs. Did she have those when she was originally rigged? I can only help you with your question number 2. Probably the lines around the mast were fitted like this. Thanks Jules, thats very helpful! Clever method. So now I got enough to start with it. We do not know how the masthead of the mizzen was shaped, since that mast did not survive. On contemporary models, it is squared below the trestletrees like the fore and main, so that is what we did on the reconstruction. One of the crosstrees does survive, and the notches in this for the trestletrees indicate how far apart the trestletrees were, which is some indication of the size of the mase at this point. The evidence we have for the wooldings on the mainmast indicates that the rope was nailed to the mast in a number of places. There may have been a knot like the one Jules illustrates, but the rope impressions in the mast are not sufficiently clear to allow us to be certain. There were probably red arming cloths (skanskläder) at the tops, since there is a receipt for their purchase and the arming cloths along the railings were rigged (there are still fragments of their lacings in the holes in the fiferails). 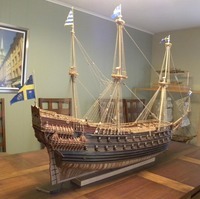 The color is indicated in the purchasing accounts - red seems to have been the standard color used in more or less all Swedish ships in the 1620s, as far as I can tell. About the tar, we have no evidence of heavily tarred rope anywhere in the ship (except for one of the anchor cables, which had a barrel of tar spilled on it when the ship sank). There is evidence for light tarring, so there might be a little darkening of the hemp and possibly a slight reddish tinge, but not a lot. 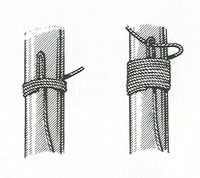 The tarring would give the rope a harder, non-fuzzy surface, so waxing the rigging line would help to replicate that. Many thanks Fred! I bought natural colored waxed ropes and will turn them slightly darker. I will try to make skanskläder if I can make it look in scale. I think you mentioned red being a standard color for swedih ships at that time earlier. That counts for the painting on the actual ship aswell if I remember correctly? were the sailclothes and the leeches also tarred? In the report "The Sails of the Wasa" of Sven Bengtsson 1975 in Nautical Archaeology there is no hint. There is no evidence of tarring on the sails, and if the boltropes were tarred it was only lightly. Hey all! What does the first mast on the bowsprit look like where it connects, seen from the front? Would it have two holes and wheels? All reference I've found show it from the side or the sail is blocking the view. I think this might help you. Note that the crowsfeet on the fore topmast stay were changed to a simple block and tackle arrangement, and that the sprit topsail yard was lowered out of its set position after Fred gave me some advice on how to improve my rig. 1. Whats the purpose of the heavy angle of the tops? I bet this is a really old question and I've been trying to find the answer but no luck. 2. I read in Vasa a swedish warship that the topgallant masts may have been on deck. I´d like to try to do that on my model. What place is most plausable to stove it in your opinion? Is there perhaps a contemporary painting showing this? 3. How would the flag poles connect to the bigger mast connections with the above setup? Sorry these ships and their rigging is new to me and I hope you get what I mean. 1. We have no clear idea why the main and mizzen tops are raked so much. I can say from the time I have spent up there recording that the slope is seriously inconvenient, especially when you are moving forward. I think the reason is probably aesthetic, as the angle of the fore and main tops more or less matches the angle of the railings at that location. Note that the fore top is level. 2. The topgallant masts could have been stowed on the chainwales or lashed down to the central gratings. 3. If the topgallant masts were stowed, the flagstaffs would have to be set in their place. We assume that the flagstaffs are slightly smaller than the topgallant masts, but the mizzen topmast cap survives, and this suggests that the lower end of its flagstaff was not much smaller than the upper end of the mizzen topmast. It should have been possible to set the flagstaffs on the fore and main in place of the topgallant masts, pehaps with some packing. Of course, we cannot be sure of this, and it may be that the topgallant masts were in place, but not the yards. We do not have the number of deadeyes of the size we would expect for the topgallants, which might indicate that the masts were set up. The masts, if rigged, would have been completely above the water even after the ship sank and thus would have been salvaged with their gear soon after the sinking, along with the topmasts.